Nothing says summer like fresh corn on the cob. I love corn on the cob and try to incorporate it into as many meals as possible during the summer months. I always just boil it on the stove top. It wasn’t until this summer until I started branching out and grilling it. I know–I’m late to the game here. Typically, I just lather the corn in a butter bath and call it a day. For some reason though, I got this wild idea of mixing the butter with Greek seasoning, sprinkling fresh dill and feta on top… Kind of like Mexican Street corn which I love ordering at restaurants, but for some odd reason have never made it at home. 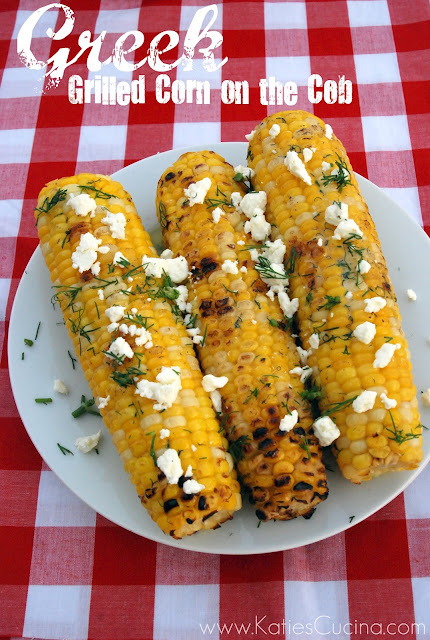 So I present you with it’s cousin… Greek Grilled corn on the cob! Pair the Greek Grilled Corn on the Cob with Grilled Greek Chicken Strips and Greek Pasta Salad for a complete Greek inspired meal! Preheat a gas grill to high heat. While the grill is preheating melt butter and mix with 1 teaspoon fresh dill and 2 teaspoons Greek seasoning. Using a silicone brush begin to spread the butter over each ear of corn. You should use about half the mixture (the main goal is to get each corn on the cob a generous coat of the butter mixture). Place the corn on the grill and let it cook for about 10 minutes on medium-high heat (turning every few minutes). Remove corn from the grill and pour remaining butter over the corn. Sprinkle with feta cheese and the remaining fresh dill. Serve immediately and enjoy. Mmmm…this sounds delicious. Love grilled corn on the cob…and these extra flavors sound fabulous! Adding the additional toppings brings the corn to a whole new level! I love Greek seasoning and of course on corn! Great idea! Cathy–I swear I’m addicted to the seasoning… it’s a bad addiction to have! I haven’t even had the Mexican kind yet–boy am I behind on the times!